As I was driving home from school the other night, I tuned into NPR and listened to the various speeches at the Republican National Convention (RNC). I found most of the speeches to be pretty typical and generic; nothing out of the ordinary or spectacular. Sometimes, I really don’t understand how some American citizens (or citizens of any country) can be so trustworthy of politicians who constantly glorify the candidates they favor. I understand support, but when you glorify someone, you paint such a perfect image of them, as if they are saints, super-human, or without faults. And in the realm of politics, who would want to elect a leader who admits his/her flaws? We want to vote for perfect people, right? After all, that’s what leaders are “supposed to be,” right? When we glorify people, we are subsequently erasing their flaws and humanity. We are making them equivalent to Prophets (depending on your interpretation of Prophets) and even, to God Himself. We don’t see them as human beings like ourselves; instead, we perceive ourselves as inferior, incapable, and imperfect compared to the leader. This is why we turn to them, because we believe they possess traits, characteristics, and skills that we lack within ourselves. This is the brainwashing of politics that I absolutely despise. Even some of the greatest leaders that I admire like Salah Al-Din and Haroun Al-Rashid had flaws. In fact, I admire a leader more so when he/she admits his/her mistakes. Malcolm X for example was never afraid to announce his mistakes, and his actions reflected the kind of leader who was open and receptive to learning and improving. As my thoughts wandered on these issues, I heard loud applause and cheers when the former Mayor of New York, Rudy Giuliani, walked on stage. At first, he made the expected remarks and criticisms of the Obama campaign, and he even encouraged the audience’s disrespectful mockery of Obama’s experience. A few moments later, Giuliani made remarks that reminded me why I sometimes feel so insecure living in the United States. “For four days in Denver, the Democrats were afraid to use the term “Islamic terrorism,” he said loudly, while the audience booed at the Democratic party. “I imagine they believe it is politically incorrect to say it. I think they believe they will insult someone. Please tell me, who they are insulting if they say, “Islamic terrorism.” They are insulting terrorists!” Thunderous cheers and applause followed. As I was driving past the street lights, the gas stations, the department stores, and the neighborhoods, I felt so disconnected from everything; like I didn’t belong. I felt like I couldn’t recognize anything for a moment. I couldn’t help but feel discouraged, powerless, and subordinate. The fact that thousands of people agree with Giuliani’s statements is probably the most disturbing thing to me. It represents how prejudice, intolerance, and ignorance exists in a significant portion of the United States. It’s too obvious for people see how the word “Islamic” automatically associates terrorism with the religion of “Islam,” and yet, Giuliani is able to follow up with some ridiculous statement that doesn’t make any sense at all! “They are insulting terrorists”? First he mentions “Islamic terrorism” and then he says it insults “terrorists.” All he did was omit the “Islamic” part in the last sentence! How hard is it to see the hypocrisy, the manipulation of words, and the brainwashing? How hard is it to see the Islamophobia? As the RNC crowd cheer and applauded Giuliani for these remarks, I felt so outnumbered and hated just because of what I believe. I felt so hated just because of who I am on the outside and on the inside. These kind of fear tactics and word associations are what generate divisions, hatred, and violence. It doesn’t help our society at all, especially with the way our foreign policy is now. 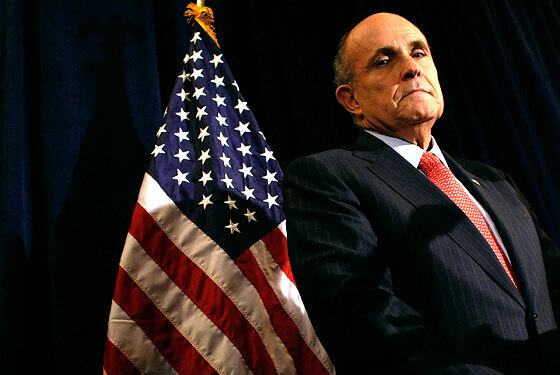 If you support the Republican party and Giuliani’s statements, how do you answer for this? How can you prove to me that his remarks don’t promote Islamophobia? How can you assure me that this will not trigger more hate crimes, stereotypes, and discriminatory acts that Muslims, including myself, experience? Politicians say they are right with us, the people. They say they understand the hardships and struggles that we endure. They say they know what it’s like to pay for high gas prices or search exhaustively for a job. They say that they’re by our sides, but the truth is, they’re not. They don’t present themselves as fellow commoners or citizens. They present themselves as perfect and flawless people. They present themselves as all-knowing entities who can make declarations, laws, and judgments in a disturbingly Divine manner. They present themselves as gods.